« Richard Henry Dana, Jr. I think that I will scream. So I saw the attached image posted on FB this morning. Okay, how many of you believe it to be true? Probably a lot because it keeps popping up in various forms. This is one of those things that obeys the basic law of the internet. ie. “Garbage in, Gospel out.”. By the way, one of the other basic laws of the internet is “The Internet is forever!”. I suppose “Stupid is forever” too. I have tried to get to people to check with the snopes.com web site to check out internet/urban myths. But somehow I get tired of continually repeating the idea. So for umpteenth time people go to snopes.com and browse. For straight dope on the five fridays myth, click here. Indeed, bookmark the site so that you remember to check it before you post something really stupid. 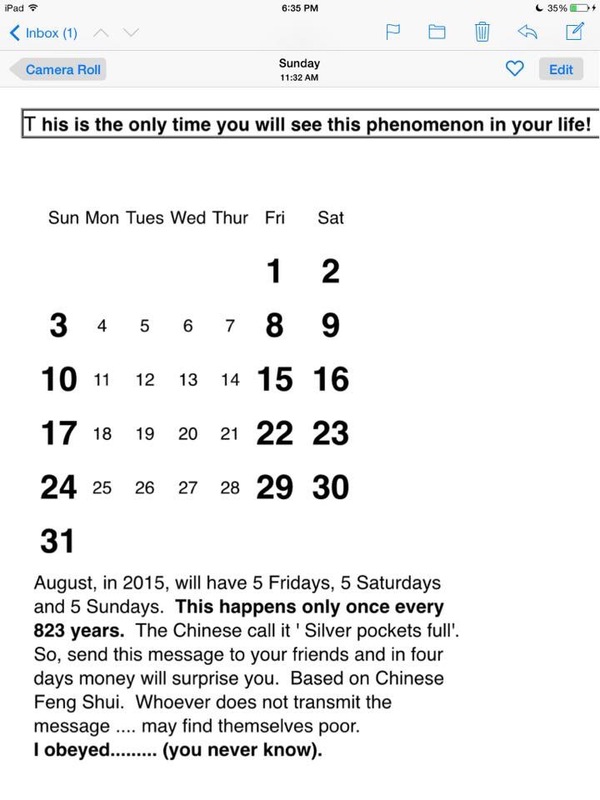 This entry was posted on August 3, 2015 at 5:13 pm and is filed under Internet. You can subscribe via RSS 2.0 feed to this post's comments.